This Sunday’s sermon will be by our guest, Dr. Christopher Carter. Growing up in the mid-west and coming from a blue-collar family, I have always taken pride in my attitude towards hard work. In short, I was raised to believe that a good work ethic would take me far in life; even if the workload made the “journey” challenging, I believed that it would make the destination all the more sweet! My understanding of work is pretty typical within America. According to the World Economic Forum we rank 16th among developed nations in the number of hours worked per week averaging 34.5. We are a hardworking people! 6Brothers and sisters, we command you in the name of our Lord Jesus Christ to stay away from every brother or sister who lives an undisciplined life that is not in line with the traditions that you received from us. 7You yourselves know how you need to imitate us because we were not undisciplined when we were with you. 8We didn’t eat anyone’s food without paying for it. Instead, we worked night and day with effort and hard work so that we would not impose on you. 9We did this to give you an example to imitate, not because we didn’t have a right to insist on financial support. 10Even when we were with you we were giving you this command: “If anyone doesn’t want to work, they shouldn’t eat.” 11We hear that some of you are living an undisciplined life. They aren’t working, but they are meddling in other people’s business. 12By the Lord Jesus Christ, we command and encourage such people to work quietly and put their own food on the table. 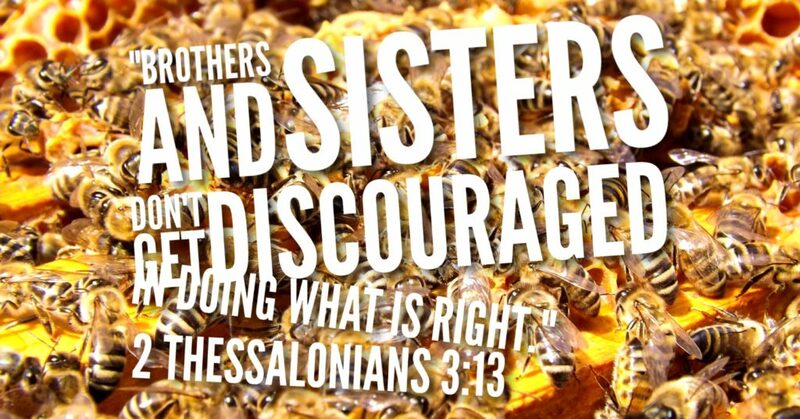 13Brothers and sisters, don’t get discouraged in doing what is right. The writer of 2 Thessalonians 3:6-13 is worried that a sense of complacency has befallen the community in Thessalonica and he urges them to avoid idleness, with idleness being understood as not working for what you receive. Now clearly most Americans do not have a problem with idleness and in fact work very hard. But I believe the deeper question the author is posing to the community in Thessalonica and to us today, is what and whom are we working for? Do we find our vocations fulfilling, do they lead us to a more flourishing life? Or are we busybodies, working for the sake of work, working with an idle heart and mind? Given the tension in our country in general, and within Christian communities in particular, I was moved by the Spirit to focus my sermon on divisions within the Church rather than my previous topic of “busyness.” To be sure, there are deep divisions within American Christianity surrounding the election of President-elect Trump, as exampled by the division among conservatives and liberals alike regarding his recent selection of Stephen Bannon as his Chief Strategist. Ultimately I believe that the Gospel calls all Christians to be in community with one another, to foster loving relationships with one another, and to heal divisions. To that end I would be excited and open to continuing this conversation with anyone who is interested. No blame, shame, or judgment; just loving conversation. Feel free to contact me via email at christophercarter [at] sandiego [dot] edu. I look forward to hearing from you! I just finished listening to this sermon for the second time as I wasn’t able to attend the service. It created a bit of a stir in my family so I was intrigued. I like to be challenged in a message and I believe this sermon was spot on. It confronts an issue and offers a christian response. Well done.